I spent my early years in Waco. The highlights of my youth included reaching the rank of Eagle Scout by age 12 and meeting Priscilla (on a blind date while still in our teens) - we have now been married for over 40 years, have one daughter, one son, and (so far) one granddaughter. Through various twists and turns of life, I ultimately enrolled in Baylor University (a matter of the university giving me a second-chance, despite some misguided, academic choices during my later high school years). After what I thought would be a temporary detour from medical school, I attended Baylor Law School. Though, at the time, I scarcely knew of IP law, I would ultimately learn that the combination of my science training for medical school, and my law degree qualified me to become (after taking the Patent Bar Exam) a Registered Patent Attorney. My litigation training through Baylor Law School's renowned litigation training program would set the stage for my present career. Though I never returned to my medical school track, I have done a substantial amount of work in the medical and surgical device field, both in patent prosecution and litigation. Though I specialize in Intellectual Property Law, as well as practice in the export control law practice area, Gray, Reed & McGraw affords me ready access to specialists in virtually all legal fields needed to serve my clients, including highly experienced attorneys in the fields of corporate law, energy law, banking, securities and finance, tort law, environmental law, regulatory compliance, trans-national transactions, public/private infrastructure projects (domestic and abroad), public policy, and import/export laws and regulations, just to name a few. 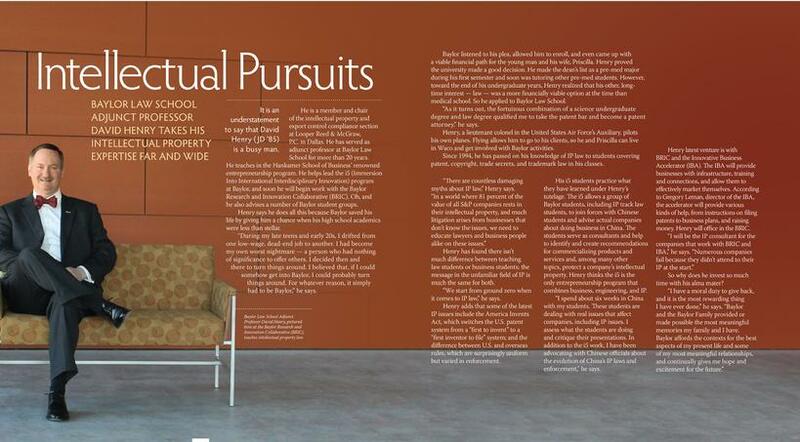 My own practice primarily involves patent infringement litigation, trademark infringement litigation and trade dress litigation in Courts throughout the United States, as well as prosecuting patents and trademarks before the United States Patent and Trademark Office (and in patent offices throughout the world) and advising clients on Export Control Issues. I also assist clients (in part through "intellectual property audits") in identifying and strategically managing patent, trademark, trade dress and other intellectual property assets. In geographic areas (and countries) in which I am not licensed to practice law, I perform consultancy services in assessing IP assets, opportunities or threats, and advise companies of the general principles of Intellectual Property Law that apply to their situations. Since 1994, I have also served as professor for patent law courses at Baylor Law School in Waco, Texas, and also teach on an as-needed basis in the Entrepreneurship Program of Baylor's Hankamer School of Business. Teaching in this ranked-second-in-the-nation Entrepreneurship Program involves, in addition to intellectual property-related classroom instruction at Baylor University's main campus, IP-related instruction and oversight of Baylor undergraduate, business graduate and law students, as well introducing IP principles to company representatives who are engaged in the program's commercialization projects in China, and most recently in Africa. As a further part of my "Baylor give-back", I also serve as the Faculty Advisor to several Baylor University student organizations, and provide a variety of other services to Baylor and its students as and when I am able. Teaching and mentoring Baylor students is, for me, a "labor of love", and is a way for me to pass along a part of that which was given to me by the generous members of the "Baylor Family" when I was a student, and without which I would have nothing of the life that I and my family have today. As an avid aviator and aircraft owner, I am able to implement a core policy in my practices: I can be anywhere, anytime to address client's needs. As a result, most of my clients have never actually visited any of my offices, and my clients, cases and projects are dispersed throughout North America (and beyond). Not having to rely on the airlines and their schedules, I am able to conduct meetings in as many as four different cities in a single day. On the "quality of life" side of the private aviation equation: It is only because of my ability to fly into, and operate out of any city or area with an airport, and on my own schedule, that I am able to balance the travel needs of my international law practice with having my primary residence other than in a major airline hub city. I live near Baylor, in a suburb of Waco, Texas, where I enjoy many Baylor University activities and relationships, as well as a smaller city lifestyle during my off times. Quite important to me are the unique experiences and memories that private aviation has afforded my family, as reflected, in part, in the Photographs with Altitude section of this site. 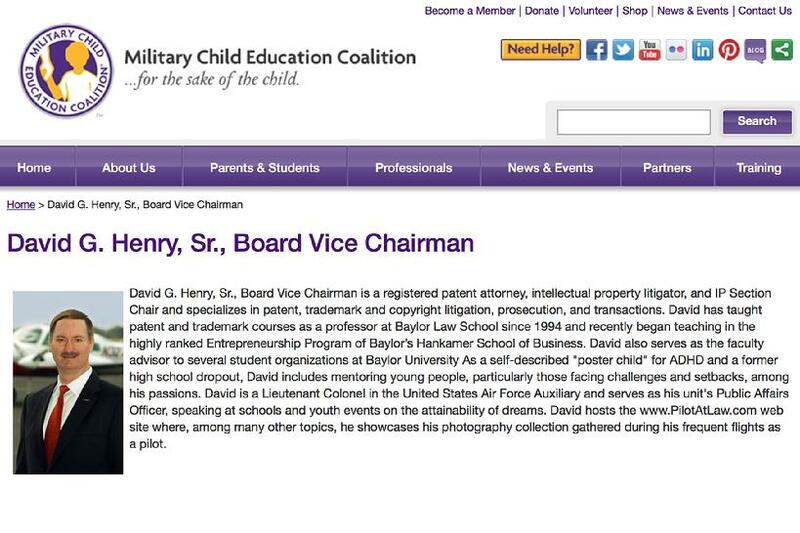 I also am honored to have served as Vice Chairman of the Board of Directors of the Military Child Education Coalition - a remarkable organization that serves over 2 million children whose families serve in uniform (please click on the preceding link, and consider supporting the worthy mission of "MCEC" in any way that you can). Though I have now stepped aside to allow for "new blood" on the Board, I remain committed to supporting this extraordinary organization. As a Lieutenant Colonel in the United States Air Force's Auxiliary, I serve as Public Affairs Officer for my unit, that flies humanitarian, search-and-rescue and disaster relief missions under auspices of the U.S. Air Force and a variety of federal and state emergency services agencies. To round out my interests (as time allows), I enjoy spending time with my family, close friends and our students; hiking and kayaking; history-related tours and exploration; photography (mostly outdoor and aerial photography using my Canon 7D and 50D SLRs - see My Other Photo Favorites); food (everything from fine dining at favorite restaurants throughout the U.S. to grilling out), and listening to music of most any genre (live or recorded). Please note (as I am required to say) that nothing presented in this website or linked articles is intended to constitute legal advice. All such information is presented for educational purposes only. Each matter requiring legal advice must be evaluated on an individual basis by an attorney of your choice, taking into consideration the specific facts and needs that are applicable to your circumstances. Also, this website is not intended to promote my law practice. I describe my practice as background for the consulting work that I provide (under Texess IP Consultants), for example, in jurisdictions (such as Europe or China) in which I am not licensed to practice as a lawyer. If you have any need that relates to intellectual property (patents, trademarks, copyrights, trade secrets, any issue of infringement in any of these areas, or relating to export control issues, you will need to contact an intellectual property specialist (a registered patent attorney, a patent litigator, a trademark attorney, or one who otherwise specializes in addressing your particular needs) or an export control practitioner or consultant. Proper handling of any such matters is a highly fact-specific process to be handled by a properly licensed and highly experienced attorney or consultant whom you advise of your particular goals and circumstances. Thank you, once again, for visiting my site.